Well well well the Dopey Challenge has now come and gone. Two weeks to be exact. Has the excitement worn off? Not in the least!! Do I wish I was still in Disney? Hell yeah! But as I sit here in cold/windy/snowy Boston, it is my time to reflect back on the experience and answer some of your questions about the Dopey Challenge. If you told me a few years ago, that I would be able to run 48.6 miles in four days I would have laughed in your face. I tried to enjoy every second of the journey and live IN the mile rather than think about how many miles or races I had to go. It allowed me to truly be in the experience. *How did the shirts fit? Five of the six shirts were long-sleeved tech shirts, where the 5k was a short-sleeved cotton t-shirt. I ordered men's small for the shirts this year and they fit like a glove. Last year, I ordered a men's medium and it was HUGE and boxy. As a result, I went a size smaller this year and the long-sleeved shirts fit great. Now the women's sizes I've heard were true to size and the ladies I know were happy with the sizes they ordered. There is a table at the Expo where you can exchange sizes, but I know from experience that it is rare to be able to size down at that table. I tried last year and failed miserably. *Did you visit the parks while you were there? How long per day? You bet your BOOTY I did. This trip was the big vacation for the year for my wife and I. We were gone a full week. We flew down on a Tuesday (Jan 7) so we had six days in Florida then flew back to Boston on Tuesday (Jan 14). We had the five-day park hopper pass. So you can see we took FULL advantage of the park hopper pass. I spent most of the days at the park. The only time I napped was after the half marathon. After the full marathon, I made sure to ice my knees/ankles. I actually think walking the parks kept my legs feeling loose and helped the lactic acid move on. I know "experts" recommended staying off your feet. Well, I didn't feel like I had that luxury after spending so much money to go to Disney. I wanted my money's worth for both the races and the parks. *Where did you eat dinner? How early? I did try to get to bed each night by 9 at the latest. The mornings wake-ups were between 2am and 4am. So our dinner reservations were set between 5:30-6:15. *Are there healthy food options at Disney? There are!! I was able to find great selections at all of the Disney parks, hotels and restaurants I visited. I made sure to always keep baby carrots and apple slices in my bag while we were walking around the parks. You can obviously bring your own snacks, but if you have to buy on site (we did) there are options!! 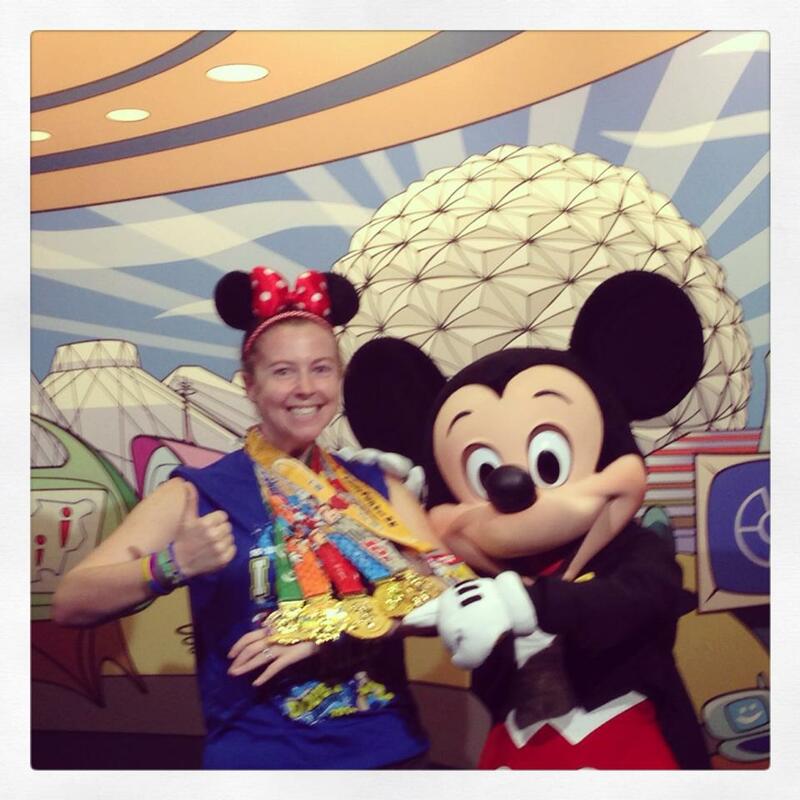 *Do people wear the race medals/shirts around the parks? HELL YEAH! Be proud of the bling. 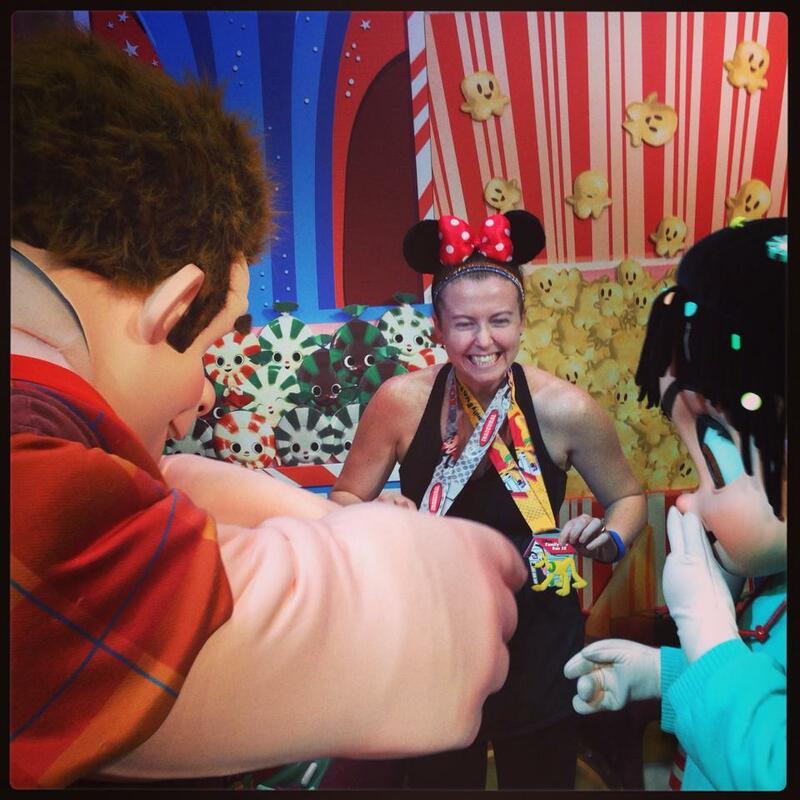 Whether you participate in the 5k, 10k, Half, Full, Goofy Challenge or Dopey Challenge or any other Disney race where those medals with PRIDE! Also, without fail, every cast member at Disney congratulated me on my race. Outstanding! Where else can you feel like a rockstar as dozens of people (or more) congratulate you on your accomplishment. I also would high-five other folks I saw wearing race t-shirts or medals. It is like a giant party for you! Or maybe I just looked at it that way. I did make sure to bring my bag and store my medals in there when on certain rides. *How was running in costumes? I am so happy I did it. Now you can see I didn't run in FULL costume like some folks do, but mine were recognizable. A great way to win over the spectators. It was so cool to hear "Go Jessie Go" or a little kid saying "Mom, it's Snow White!" It is a fun experience. Here is a post I wrote about winning over a race crowd - click. Make sure you test your costumes out before race day! The last thing you want is a malfunction before embarking on a run. *You took part in Race Retreat. Was the experience worth it? I paid $200 to take part in the Race Retreat before the Half Marathon and Full Marathon. Individually the Race Retreat is $120 for each event so I saved $40. For me, it wasn't worth it. You have to pay extra to bring family/non-racers into the tent and we didn't have those funds/wanted to spend that money elsewhere. While I was happy for the heated tent and special port-o-potties, the lines for me were just as long as outside. Plus I left the Retreat so early I still had to stop at the public port-o-potties anyway. Afterwards the food was eggs with cheese, bacon, potatoes and I think something else. I don't eat cheese so I was going to pass on the eggs when a nice volunteer offered to find me some sans cheese. Oh it was so sweet of her. She did in record time too. But for $200 I ate a couple bagels, some bacon and some eggs. I didn't spend as much time in there as I would've wanted because 1) I had to get to the corrals early being in the early ones and 2) I didn't like making my family wait for me outside while I ate. So if I was to do a Run Disney race again, I would not bother with the Race Retreat. *Of the four races, which was your favorite event? Oohhhh this question is tough tough tough. I loved all of them for different reasons, but I think it would have to be the Full Marathon. I just had a freakin' blast out there. You can read the recap here. 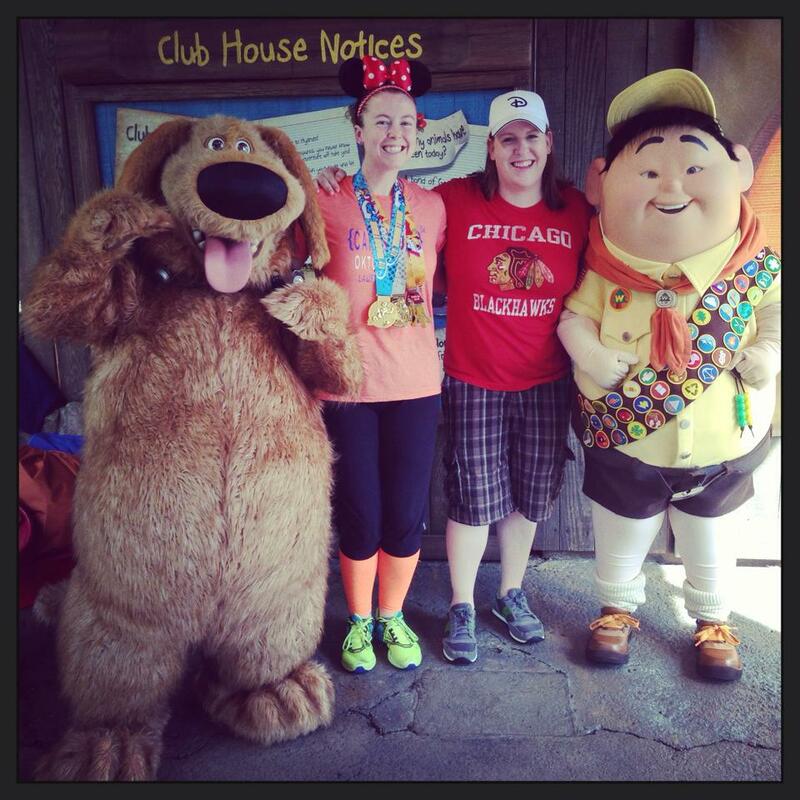 I saw the most characters and had the opportunity to run through all four parks. *Was the Dopey Challenge worth the $495 fee? With the prices of half marathons and full marathons increasing by the day, the price seemed fair for four races. Disney really knows how to take care of business when it comes to busses, volunteers, EMTs, water stations, GU stations, etc. Plus the organization puts the participants minds at ease. *What was your biggest barrier to overcome during the challenge? I grappled with this one for a while, but knew it had to be the four early morning wake-ups. To me, that is a tough thing to train for. I can try to get myself to bed early, but four days in a row is still a tough feat to overcome. It really hit me after the half marathon. After that race, I came home and actually napped for 45 minutes. The 2am wake-up call for the Full Marathon was the roughest. I don't think I actually felt awake until I crossed the Start Line. There are folks that don't wake up as early as I do for the races, but I get nervous with the busses. Hi I am a worrier! So I would rather be early than delayed for any reason: full bus, traffic, etc. *Will you do it again? The wife: "NEVER!" :P Let's just say my wife was not a fan of waking up each morning to make sure I had everything ready to go pre-race. Now my answer ... not in the near future! Between the length of the vacation, hotel costs, food costs, race fees, etc, it seriously is our only vacation for the year. Now budgeting can change all that - which we did - but still one full week was a lot of time away from home with two pups. I did enjoy every minute of it. If you have additional questions, feel free to send them along! I can always edit this post.